Here is a video from our recent Nightclub Self Defence Seminar. Is your martial art / self defence / combat training effective outside the gym? Our nightclub / bar seminar gave students an insight into the challenges faced defending your self in a different environment while also trying to protect those you are with. Our next FREE Urban Escrima Self-Defence Taster Session! 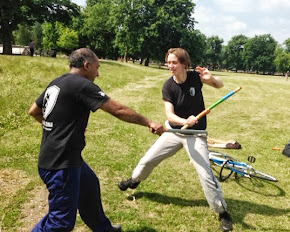 Our next Urban Escrima Self Defence seminar takes place on Tuesday 25th at 7.00pm and Thursday 27th at 6.30pm at London Fields Fitness Studio, London, E8. This is a fantastic opportunity to try out REAL Self Defence for FREE. Please contact us on: info@urbanescrima.com to book your place!